Large flyovers (Helicopter/Jib) may represent large distances or a higher angle - ie: looking down on your subject. It's easy to think that buying or hiring expensive equipment will just yield great camera movements naturally; however, this isn't the case. When using specialized gear such as a Steadicam or any sort of airborne device, it is advised that an experienced operator is hired. Although it is possible to hire grip equipment for relatively little money, do not fall into the trap of using inexperienced operators as you'll make a better film if you keep your shots simple rather than use an inexperienced operator on an exotic bit of grip equipment. Learning a piece of equipment without guidance can also be harmful to a production. Learning incorrectly is a good way to learn bad shortcuts and habits. It is also an extremely easy way to break expensive equipment such as a hib. 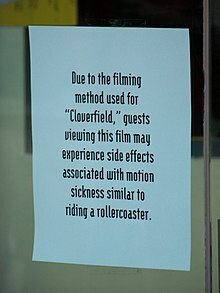 A sign warning customers about side effects relating to motion sickness due to the shaky camera technique being used in Cloverfield. Handheld camera movements can provide specific tones and emotions to a viewer. In found footage films such as Chronicle or Cloverfield, the shaky camera effect is used to represent a home video effect. A handheld and slightly shaking camera can give extra intensity to action sequences and can also give a documentary-drama-like feel to a movie. Using a shoulder or handheld rig. Giving a camera to an actor while running or other moving shots. Just going vanilla and holding the camera. Adding a camera shake in post. There are many pros and cons to using Shaky camera movements in a shot, a balance should be found between both. Can add a certain "Believability" to a shot. Effects are harder to integrate. Harder to hide crew and other equipment. A dolly mounted on circular track. A dolly is a filmmaking tool used generally to get moving shots along a 1 dimensional plane. For example, a shot moving down a hall or moving towards a subject may use a dolly. A dolly generally consists of a cart which will hold the camera and perhaps the camera operator and may run on a track. If the camera operator is on the cart, a grip may be needed to move the dolly. This person is rightfully named the "dolly grip". Circular Dolly - Circular track designed for Dolly cart. Tripod Dolly - Designed to attach to the bottom of tripods. Spider Dolly - Designed by Zach "Final Cut" King - Designs. Pico Flex Table Dolly ® - A table dolly similar to the Spider Dolly. Wheelchair - A wheelchair is a popular alternative they can be found cheap on auction sites. Dollies are a popular alternative to a tripod as it can provide interesting shots and don't need specialised operators to run however the dolly and track can take time to set up and operators are needed to run the camera and cart. Sliders are virtually a small dolly. They usually sit on a tripod and can be operated by a servo or manually. Sliders are generally used when a dolly isn't practical to set up or the shot doesn't need to move too much, for example; time lapses and shots of a smaller subject. A Jib or Camera Crane is essentially a camera mounted on a crane arm. The crane arm is usually rested on a flat platform such as a tripod, but can is also found on dollies, vehicles and even a SteadiCam. Crane shots are often considered to add "production value" and are often used for establishing shot for this reason. At the base of the jib arm, weights provide a counter balance to the camera allowing the operator to create streamlined movements without exerting unnecessary force. At the base of the Jib arm the operator controls pan, tilt, zoom and focus. In his/her control panel the operator views the camera's digital output via a monitor - when shooting in film the monitor will show the image from the gate. Jibs are often used in live television as they are versatile enough to cover a wide area with a single camera from a wide variety of depth and angle. 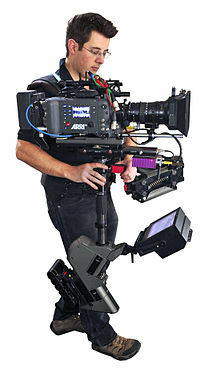 The Director of Photography (DP) may employ the use of the jib to achieve smooth movements across crowds and/or stages. On smaller jibs, a pan/tilt head may be used and operated mechanically via metal wires. Focus is pulled via a wireless mechanism or smaller focal lengths with a larger f/stop may be used to increase Depth of Field. In larger Camera Cranes, the head and arms may be operated via a joystick or programmed via a computer. Focus is also pulled the same way, but external field monitors will be connected either wirelessly or wired. Because of this, jibs are often expensive, the smaller amateur jibs starting from $500USD and the price only increase with the with the Hollywood jibs running in at many thousands of dollars. A low-cost way to recreate small jib moves with a basic tripod is to fold down the front leg and push forward the camera and pan upwards. The camera altitude will drop, creating a jib movement forwards. The larger Steadicams are designed to support 35 mm film and digital cinema cameras (like this Arri Alexa) and even IMAX cameras. There are a few other stabilisers on the market, some of which use a counterbalance on the bottom. The Steadicam was a big breakthrough in stabilisation for a cinematographer. It was developed in 1976 by Garret Brown and it used a counterbalance system at the bottom which was used to isolate operator inconsistencies. When using a vest, it can allow an operator to run through a set where the footage just seems to glide through. A low-cost way to stabilise camera movement is to use the basic tripod as a makeshift steadicam. Attach the camera to the tripod as usual, collapse and fold the legs together - (experiment with extending the legs a bit to increase stabilisation) and attach a small weight to the bottom of the legs. 2 or 3 pounds will be plenty as it doesn't need much. Some tripods are a bit heavier and may not require any additional weight at all. The idea here is to hold the rig so that the camera is above your hand and the weighted legs are far below. You want the camera to be able to swivel around freely. Loosening up all of the adjustment handles may help keep things a bit smoother. Shoulder rigs are another stabilisation tool which generally rests on the shoulders of the camera operator. It allows an operator to get into the action with a degree of stability. It's not as smooth as Steadicam, but some would argue that it is more natural. Suspension cables are an interesting concept for faster moving action around a set area. They are mainly used in sporting arenas because all the cables can be attached onto supports. This makes it difficult to use in the field as supports have to be erected or attached to strong trees or structures. SpiderCam ® - made by CCS in Austria by Jens Petersen. Helicopters are a logical choice for aerial photography and videography as they aren't too hard to learn and can provide amazing imagery. Helicopters can be extremely hard to manoeuvre in windier weather and in tighter locations. Quadcopters and copters with more rotors provide more stability and more lift to carry heavier equipment. These also make it easier to operate in less than better weather. One method of obtaining an aerial shot is tying your camera or a plate to a group of helium balloons, which then floats above the scene that is to be filmed. The disadvantage of this includes that the camera will often face the wrong way and that too many balloons may cause the camera to drift away with the wind. Weather balloons can also be used as an alternative and space flight has been achieved with GPS being used to locate the camera after although stock footage can be used instead and is relatively cheap. In aircraft and other aerial shots, an external stabilizer might have to be used. This may include a Gyro or certain capsules that offer stability. This page was last edited on 17 November 2016, at 02:42.